You are here: Home / News / Am I Ugly…..? (ThyBlackMan.com) Hello! I have a question. What makes a person ugly, physically? Is it the way their eyes are shaped? The way their noses sit in the middle of their face? Is it the shape of their mouths or their lips? I’m asking you because I was asked the question, but I didn’t have an answer. As a person that has struggled with his looks for majority of his life, and although to a lesser degree still struggle with them, this question hit home. For the most part I’ve always thought I was ugly. When asked why I thought that; my face is long, I have a hump on the bridge of my nose from a surgery I had in the 6th grade, and my ears are smaller than normal. My head is shaped differently from other people and I’m dark-skinned. I think most of my thoughts about being ugly stemmed from growing up dark-skinned. When I was growing up dark-skinned people were not celebrated nearly as much as we are now. In order to be black and be considered attractive you had to be light skinned with “good hair.” Dark-skinned people were called tar babies and told we would look better if we were lighter. I was told that if I took cold baths my skin would lighten up. I tried it once or twice, but it didn’t work. No lie that happened. How could kids, growing up in a small town, develop such a negative idea about skin complexion? Who made us believe that lighter skinned was more appealing? Did someone sit us down and say “lighter skinned people are more attractive than darker skinned people?” And where did we learn to be mean to dark skinned people? All my memories about growing up dark skinned were not negative. I remember a compliment I received in 11th grade. I’ll never forget it, clearly. I had just left band practice. My aunt took me to the store to get something to snack on. When I was cashing out the cashier looked me in the eyes and said “you’re a pretty little chocolate boy. You don’t see too many of yall.” I couldn’t help but smile. Thinking back to that moment still makes me smile, but back to the question. What are the geometrical measurements of a person’s face that determine if he or she is ugly or beautiful? What makes a person considered to be universally beautiful? Beyonce is everyone’s type. I personally do not have these answers. So of course I decided to ask you. Hopefully you are all to give me an answer to my questions. The questions I have are: what makes a person ugly, what makes a person un-ugly, and who determines those things. While parlaying at my favorite lounge; I saw a group of attractive women so of course I decided to ask them for their opinion. Their first response was; attitude. How can you determine if a person is ugly based off their attitude? You don’t see their attitude. Or so I thought. One woman said she can tell a lot about how a person thinks by the way he or she looks physically. I should’ve had her expound on that, but what she said didn’t register until I left the venue. (If you are that woman that said that DM me on IG so we can continue that conversation.) After explaining to them that I was asking for the physical attributes that make a person ugly; they couldn’t give me any real answers. So I had to ask the men. They did not disappoint. Their answers ranged from everything to bad weaves to the eye forehead nose ratio. After laughing at their answers I found myself asking why. Why do these things make a person ugly? Also, why are men so easily able or willing to identify what makes a woman ugly? Are men shallow? Is it because society, through the “beauty” industry, pushes such a narrow idea of what makes a person beautiful. (Perfect skin, perfect teeth, the right height, the right weight, the right height. 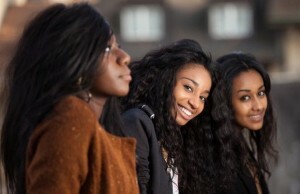 For some reason the idea of being beautiful centers around European features or African features on European women. Weird) If you don’t look like what’s considered beautiful than logically you’re ugly. Or is it because men focus more on eliminating potential partners while women focus more on choosing who they do want? This elimination vs. choosing dynamic being based off the fact that men have more options than women. Especially black men. So black women focus on what they do want. This brings me to my second question. What makes a person physically attractive? I’m a fan of natural beauty. Women that wear their natural hair have natural bodies and don’t wear make-up often or who use make-up to enhance rather than cover up, etc. I feel it must be said that just because I personally prefer natural women; that doesn’t mean that something is wrong with women that wear weave or make-up or eye lashes or any of those things. I have dated women that wore those things. It’s all about personal preference. Personal preference is at the heart of attraction. I learned that from the people I interviewed. Nearly all of them shared that sentiment. Here is where I realized I had to expand my question. Solely focusing on attraction on the physical level doesn’t adequately explain what makes a person attractive. As I dive deeper; I find that attraction is more mental than physical. A lot more mental actually. I could make the case that attraction is purely mental. It is my belief that physical attributes act as symbols for characteristics and traits. For instance, women are usually more attracted to muscular men than they are men without muscles. Same as with tall men vs. short men. Tall men and men with muscles symbolize strength and the ability to protect. The ability to protect is high on the priority scale for women. The same as with other qualities we hold dear. We tend to be attracted to what we are or what we desire to become. Imagine a business woman that lives a very strict conventional life. She goes out one evening and sees a fun-loving, maybe less successful guy and is instantly attracted to him. The people in her inner circle don’t understand why she’s attracted to him. The guy is nothing like her. Ironically, that’s what she likes most about him. He’s nothing like her; he’s what she wants be. She’s intrigued, slightly envious of his ability to relax and live carefree. Her attraction is to the thing he has that she wishes she had. The key to being attractive is to possess something, a quality, characteristic, physical feature, material possession, that the other person values. In other words; you’re not ugly, you simply don’t possess the qualities or characteristics that particular person is attracted to. Ugly is defined as: unpleasant, nasty, alarming, disagreeable, tense, charged, serious, grave, dangerous, perilous, threatening, menacing, hostile, ominous, sinister; archaic,direful,rare minacious. I wonder who started African Americans to thinking this way about themselves ? Can you say populi alban ? White people are without a doubt the ugliest people on the planet, and many African Americans want to look like them.African Americans still have a long way to go to recapture their original sense of self,and self esteem.